HF: I finished my first ferry crossing on the Sea Coral 8 at Kwun Tong Pier coming over in about twenty minutes from Sai Wan Ho Pier with Captain Freddy Chiu in charge of the vessel and its dozen or so passengers. All photos are mine taken on the 25th September 2014. Kwun Tong Ferry Pier was formerly one of the major piers used by Hongkong and Yaumati Ferry Company, (the original company was founded in 1897 by Lau Tak Po but changed its name to HKYFC in 1923). 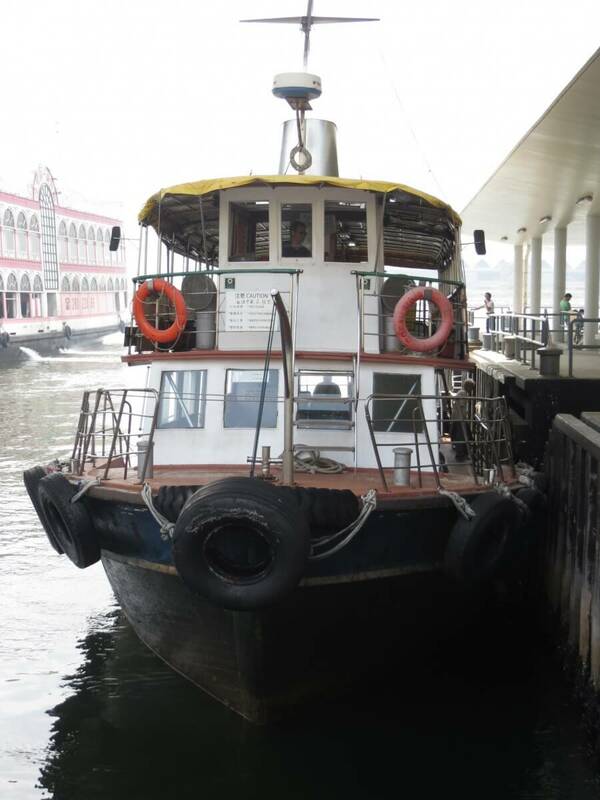 It provided regular car ferry and passenger ferry services to Central, North Point and Shau Kei Wan. However with the opening of the MTR and then the Eastern Harbour Tunnel both the car and passenger numbers dwindled and the ferry services to Central and Shau Kei Wan were terminated. Currently the remaining routes are to North Point operated by Fortune Ferry ( 富裕小輪) and to Sai Wan Ho with Coral Sea Ferry( 珊瑚海船務). 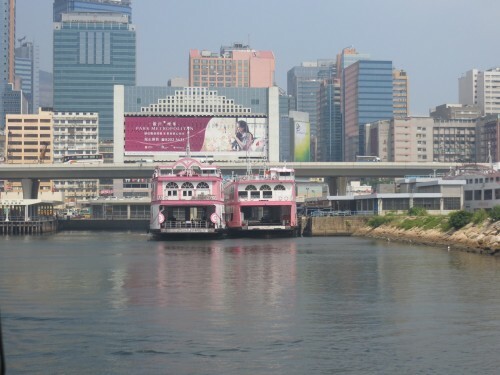 The current Kwun Tong Ferry Pier is situated on Hoi Yuen Road, Kwun Tong. To be blunt its charms are elusive when compared to other HK harbour piers – North Point contains a fish market. The pier was originally situated at Ngau Tau Kok from 1953 to the 1960s but due to reclamation work was moved to its present location. 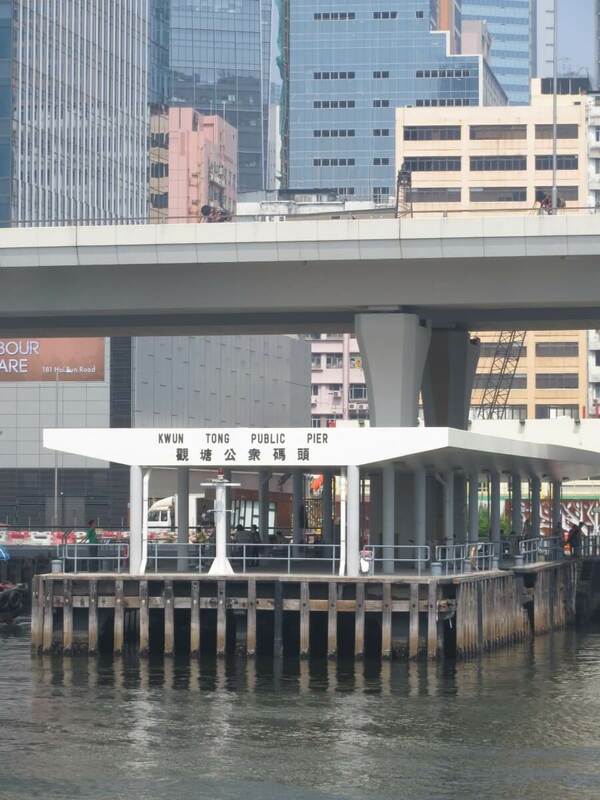 The Ngau Tau Kok pier does not seem to have attracted as many photographers as the Star Ferry at TST. I wonder why! Does any one have any images that I could insert into an article specifically about it? The ferry pier complex consists of three piers: a passenger ferry pier, a vehicular ferry pier and a public pier. 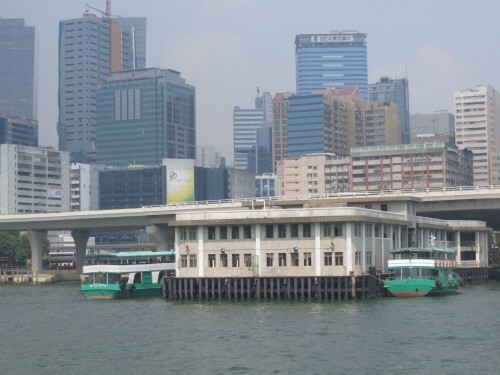 Parts of the ground floor and upper floor of the vehicular ferry pier were used as Kwun Tong Driving School. The school moved and is now at 68 Hoi Yuen Road. After the Shau Kei Wan service was terminated, its half of the ferry pier was converted into a supermarket. As business declined it also closed. Today it is no longer occupied, but is sometimes used as exhibition space. I wonder how much longer these rather sad piers will continue to see ferries berthing? And not just the pink, redundant Jordan Road ones as seen above? Fishermen using the one I alighted at appear to almost outnumber passengers. This article was first posted on 28th October 2014. On the slow boat – Sai Wan Ho, Kwun Tong, Sam Ka Tsuen ferries – part three..